Many people know IRA investing is a wise way to plan and save for the future. But what you may not know is that you’re able to use certain bullion coins as part of your Individual Retirement Account portfolio. IRA investing is a complex matter — something best handled by a skilled financial advisor. So use the bullion coin info here as a quick guide to some of the bullion coin options that are available to the general public. This isn’t really legal or financial advice, but it might give you some new ideas to expand and help your IRA investment portfolio! It would be nice if coin collectors could use any coins they choose for IRA investing — but the Internal Revenue Service (IRS) rules accept only certain types of coins. In fact, the IRS requires that the bullion coins you use in your IRA investment portfolio must have a minimum fineness (a minimum amount of proportional bullion content in the coin). Those are the percentages of pure gold, silver, platinum, and palladium your bullion coins must have to qualify under IRA guidelines. That means the old 90% silver coins — like silver dimes, silver quarters, silver half-dollars, and silver dollars — you have in change jars or in your coin collection are not going to fit the bill for inclusion in your investment portfolio. Rare coins, like the 1909-S VDB cent, also won’t qualify because they’re classified as collectible coins; collectible coins can’t be used in an IRA. Certain 3rd-party-graded (slabbed) bullion coins also will not be allowed in the plan because they, too, are generally considered collectible coins. However, bullion coins certified only for the purpose of authenticating their fineness — not for grading — will be allowed in an IRA investing plan. 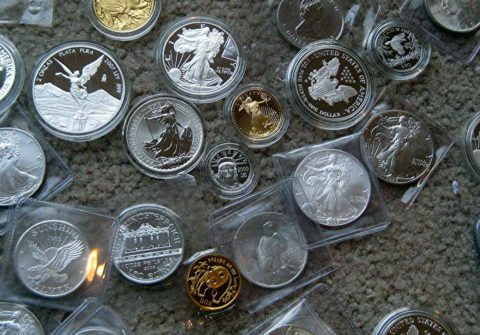 Proof bullion coins are typically excluded from IRA investment plans — because they tend to cost significantly more than the bullion value of the metal within. If you’re buying bullion coins for IRA investing purposes, you would probably want to stay away from purchasing proof bullion coins anyway. Their refined surfaces may look prettier than those on uncirculated bullion coins, but proof bullion coins usually cost more than uncirculated bullion coins. You get more bullion bang for your buck with uncirculated bullion coins! If you happen to have certain foreign bullion coins, those may be okay — based on the type of coin. So, if you’re thinking of hopping into the bullion coin boat, you’ll need to set a budget to be able to afford your acquisitions. First things first, remember that the bullion market fluctuates hour by hour and operates on a global scale. Unlike collectible coins, which tend to have price changes based on more long-term trends, the bullion market can turn overnight – and it has before. Because bullion coin prices are always fluctuating, be sure you check out the current bullion prices online so you have some idea about price outlay before making your bullion coin investment. The price of a bullion coin is usually a nominal amount between 10% to 20% more than the bullion value for uncirculated bullion coins.